Te Hapu is remote and private. It starts where the road ends. Miles of spectacular coastline and a 1000 acre farm for you to explore and enjoy, with many beaches, a luxuriant low tide rock shelf, pancake rocks, blow holes and caves. Our Shearing Shed Retreat is situated by itself at the head of a valley on our property and looks out over farm land and native bush to limestone bluffs on the skyline. Take the fishing rod for a short walk/drive down the valley (5-10 minutes) to a beautiful sandy beach. The Retreat is cosy, comfortable and clean. It has a spacious, open plan, fully equipped living and kitchen area, with a wood range for cooking, heating and hot water (fire wood supplied), plus gas rings for cooking, a gas fridge and solar powered lighting. Enclosed in a garden setting is a huge old fashioned outdoor bath with tapped hot water. Smoking allowed outside only. Pets by prior approval only. Breakfast or barbecue on the veranda while watching the light change in the bluffs. Duvet, blankets, tea towels, hand towels, bath mat and oven mit. Sheets and bath towels provided only per request (fees applies). Beautiful location that was secluded, peaceful, cozy and the perfect getaway. Andrea and Zander were super welcoming and the hikes around Te Hapu are amazing. We would love to return! My husband and I traveled from North Carolina to a remote and beautiful sheep farm in New Zealand.We stayed for 3 nights in a Sheep Shearing Shed which was rustic,romantic and equipped with everything you need for a relaxing getaway.The farm is family owned and the young couple Zander and Andrea are very attentive to making your stay the best it can be.Zander took us on a farm tour driving all over the farm showing us the spectacular views and livestock sheep and cows.There are hiking trails over the entire property and several beaches that we had all to our selves.There are no words to describe the raw beauty of this property....Thank you,Zander and Andrea we will be back!!!! We had a fantastic holiday at Te Hapu! 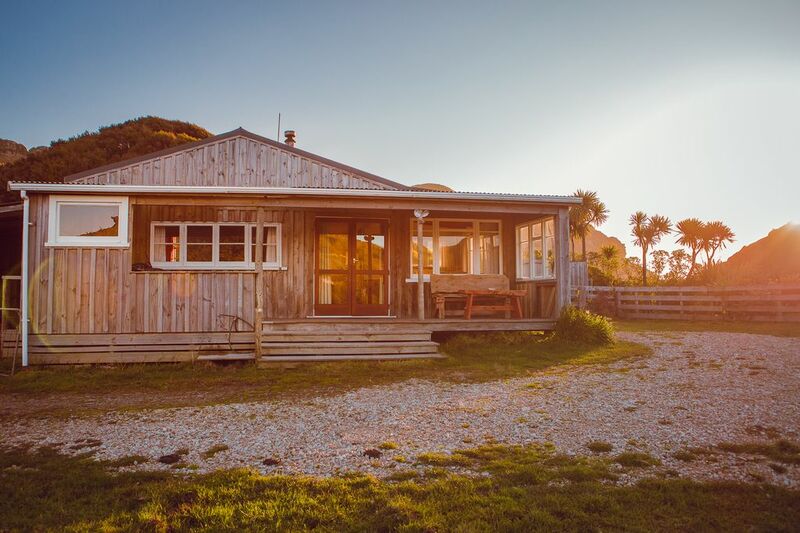 I was looking fairly randomly for accommodation on bookabach and as soon as I saw a photo of the Shearing Shed Retreat I knew I wanted to stay. I loved the journey to get there through the Westhaven Inlet. The landscape around the farm is beautiful, and the house itself is very comfortable. Some favourite things to do were: exploring the rock formations, watching the llamas, playing on Gilbert's beach, and making pikelets on the coal range. We had 5 nights here and could have happily stayed longer. Andrea and Zander were very friendly and helpful hosts. Bring some cash with you in case the yummy "Nugget Cafe" 10 minutes down the road is open. I will definitely be back! Fantastic views from walks over the farm. Fantastic views from walks over the farm. Really enjoyed our break here. Fabulous location for total rejuvenation, peace and stunning landscape. They made us feel welcome with lovely flowers in the house and a personal note with all the info necessary during the stay. The Shearing Shed was lovely and cosy and well equiped. The farm, walks and the coast line offfered even more than what we expected. We are already planning our next visit. Remember - it is remote and you need to keep in mind that gravel road to the farm is narrow and windy.